The SECC has published our first book, “Social Objects: Essays, Interviews, Projects and Interventions on Socially Engaged Craft,” and it is available on amazon! What power do objects carry in our lives? How do they influence our everyday experiences, create connection or encourage resistance? Throughout the trajectory of human history, we have used objects to contain meaning and to build relationships. In Social Objects, members of the Socially Engaged Craft Collective and guest contributors investigate Socially Engaged Craft practice through essays, interviews, project descriptions, and calls to action. The projects represented in the publication and accompanying exhibition engage the fundamental relational qualities of objects to build active, social experiences. 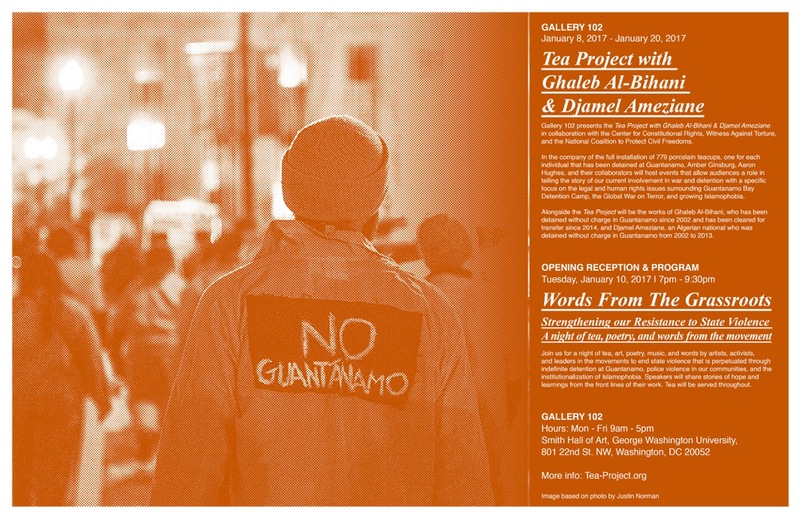 Gallery 102 presents The Tea Project with Ghaleb Al-Bihani & Djamel Ameziane January 8, 2017 through January 20, 2017, in collaboration with The Center for Constitutional Rights, Witness Against Torture and The National Coalition to Protect Civil Freedoms. In the company of the full installation of 779 porcelain teacups, one for each individual that has been detained at Guantanamo, Amber Ginsburg, Aaron Hughes, and their collaborators will host events that allow audiences a role in telling the story of our current involvement in war and detention with a specific focus on the legal and human rights issues surrounding Guantanamo Bay Detention Camp, the Global War on Terror, and growing Islamophobia. Alongside the Tea Project will be the works of Ghaleb Al-Bihani and Djamel Ameziane. Shown for the first time will be a substantial selection of the more than 100 works by Ghaleb, who has been detained without charge in Guantanamo since 2002 and has been cleared for transfer since 2014. Ghaleb, who discovered a talent for art in routine classes offered to detainees, told CCR, “Painting makes me feel as if I am embracing the universe….I also see things around me as if they were paintings, which gives me the sense of a beautiful life.” The Tea Project is also grateful to show three pieces of work by Djamel, an Algerian national who was detained without charge in Guantanamo from 2002 to 2013. The opening reception and program, WORD FROM THE GRASSROOTS: Strengthening our Resistance to State Violence, offers a night of viewing, tea, poetry, and words from activists, veterans and legal advocates.Tea, served throughout the evening’s events, is not only a favored drink but a shared moment that transcends cultural divides and systems of oppression. National Clay Week is about connecting and getting people involved in the experience of clay. Below you’ll find a list of ways to get involved at a local and national level. In alignment with the vision of the National Clay Week, the contest goal is to unite through the material of ceramics. In this contest we aim to unite communities in conversations and explorations in material knowledge, experience, and possibilities of clay: the material we all know and love. We at the SECC will be jurying the inaugural contest!!! Pitch us a project that uses clay to unite members of communities that might not normally engage each other. Outline how this project will impact those who participate, and their communities. What conversations do you hope will be inspired from the material and process? How will those conversations will shape members of those communities? Tell us how you plan on spending the awarded Amaco product and funding. In April, Fuller Craft Museum opens The Faces of Politics: In/Tolerance, an exhibition of artists that examine, on a personal level, how their creative vision is influenced by the current political unrest – locally, nationally, and on a global scale. This exhibition is current and thought-provoking, dealing with topical social issues such as race relations, religious freedom, gender equality and gun control. We are taking this opportunity to open a dialogue at Fuller Craft Museum and offer the community a place to hear multiple viewpoints and participate in an open discussion on the arts and social action. Our panel Finding a Voice: Affecting Social Change Through Creative Expression features leaders in the arts and social service field as well as practicing artists and educators. Led by Julie Burros, Chief of Arts and Culture for the City of Boston, we will address both social statements through artistic expression as well as the value of arts education in finding a voice for the underprivileged and disenfranchised. Julie Burros will be joined by Jason Talbot, co-founder and alumnus of Artists For Humanity (AFH), a Boston area non-profit organization that combines art and entrepreneurship to address today’s most challenging social, economic and racial issues. Currently serving as Special Projects Director and member of AFH’s Board of Directors, Jason has dedicated the last 25 years of his life to ensuring that Boston’s young people are guided towards a successful life by encouraging their self-expression through art. Also a panelist, Cheryl Buchanan, JD, MFA, is a co-founder of Writers Without Margins, a nonprofit dedicated to the fusion of art and advocacy, which offers creative writing workshops in unconventional spaces and produces an annual literary journal. She currently facilitates classes at the St. Francis House Day Shelter in Boston and the Center for Change in Dorchester while also teaching at Emerson College. Rounding out the panel is Bruce Hoffman and Melissa Maddonni Haims. Bruce is the guest curator of The Faces of Politics: In/Tolerance, the Director of Gravers Lane Gallery in Philadelphia, and an independent curator, artist, writer, and educator. Melissa is a fiber artist based in Philadelphia who creates knit graffiti, soft sculpture, and large-scale installations using knitted and crocheted yarns. The majority of her work is produced using recycled, reclaimed and rescued textile materials. Ms. Haims is a featured artist in The Faces of Politics: In/Tolerance. This discussion will mentor new and potential authors by demystifying the process for both proposing and writing magazine articles. The discussion will provide an overview and best practices for authors from the perspective of Ceramics Monthly and Pottery Making Illustrated editors. Interact with a series of digitally fabricated press molds to create an interlocking and stackable group of 3D clay objects. All are invited to come stamp and work on the wet clay pieces with the plastic fabricated emoji’s. After each piece is individually worked on, they will be put together, creating a larger object from the many multiples. A webcam will show how the project evolves over time. Ceramics has been a marginal practice within the history of postwar art. But embedded in a discourse of experimentation with materials, tactility, and performance, its formal concerns resonate as a parallel medium to avant-garde movements of the last 50 years. This talk argues that ceramics is a socially engaged artistic practice that integrates aesthetic concerns with pedagogical and affective discourses. The cup library at St. Olaf College aims to make ceramic objects more accessible and, in doing so; build an appreciation for and awareness of the tradition of functional pottery. Focused on community, this lending program introduces new users to ceramics and an array of contemporary makers. This presentation will examine craftivism as it has emerged in ceramic practice, tracing its roots in performative, communal ceramics and the DIY/craft ethos of third wave feminism. It will examine the relationship between craftivism and socially engaged, political, and communal ceramics, drawing from diverse examples from contemporary makers. This panel will celebrate 50 years of critical contributions by women trailblazers in their roles as artists, professors, mentors, writers, gallery owners and museum professionals. They transformed materials, pushed the boundaries of techniques, and revolutionized contemporary ceramics. *This panel will mention the work of Cheyenne Chapman Rudolph and Jeni Hansen Gard. Over the past several years, experimentation with porcelaneous clay bodies has led to new developments of whiteness, translucency, and vitreous refinement within low-fire clay bodies.This lecture will discuss the current research and development of low-fire translucent porcelain fired at cone 04. Check out the work of Ehren Tool and Carrie Reichardt. Founders Nicole Gugliotti, Cheyenne Chapman Rudolph, and Jeni Hansen Gard are all represented in this exhibition during NCECA. To celebrate its 50th Anniversary, NCECA invited Michael Strand and Namita Wiggers to curate a project to examine how clay connects communities through food today. 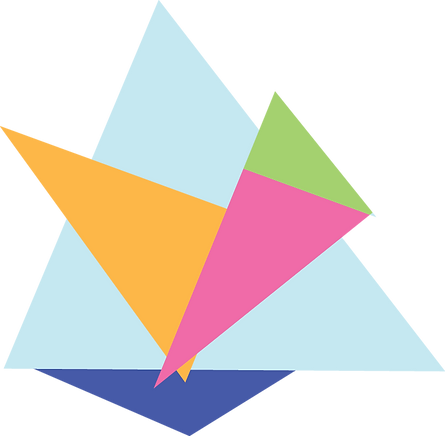 Considering the table as a literal and metaphorical space, this project includes objects, photographs, videos, and associated events during the conference, all drawn from an online archive populated with stories and images of work by NCECA members and K–12 Challenge participants in the United States and abroad. Visit ncecaacrossthetable.com and follow acrossthetable2015 on instagram to view all submissions and to connect with associated exhibition programs taking place during NCECA, including Robbie Lobell & Maryon Attwood’s The Heartland Table: A Pre-Conference Event and Adam Chau’s Sharing a Meal, 3500 Miles Apart. Check out founder Jeni Hansen Gard’s work in the Archie Bray 2015/6 Resident & Visiting Artists Exhibition during NCECA at the Red Star’s Belger Crane Yard Studios. Many social, political and environmental problems seem impossible to solve. In this exhibition, 30 artists who use fine craft media such as glass, textiles, ceramics and metal address these challenges from diverse viewpoints. 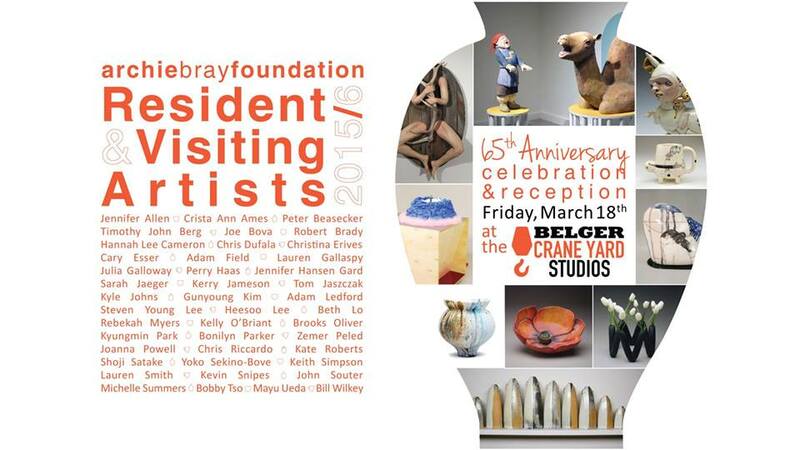 Check out founder Jeni Hansen Gard’s work in this exhibition. SECC founders Cheyenne Chapman Rudolph and Forrest Gard are both featured in this exciting exhibition. This exhibition showcases the work of eleven artists who effortlessly integrate video into their studio practice. Some artists use cameras to document their work being used (or abused). Others use video to document a process that is perhaps more important to them than finished, fired objects. All of these pieces have a life of their own on the Internet, where they can be shared in ways that physical objects cannot.